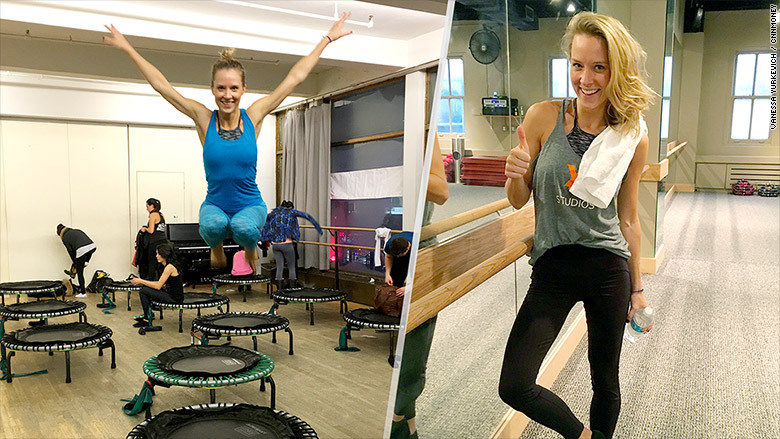 Chloe Licht is a ClassPass superuser -- that means she takes 14 to 15 boutique fitness classes a week. "I'm not married with kids," she told me. "I have free time, and I'm sure that what I'm doing is by no means a normal attainable schedule for people with different lifestyles." 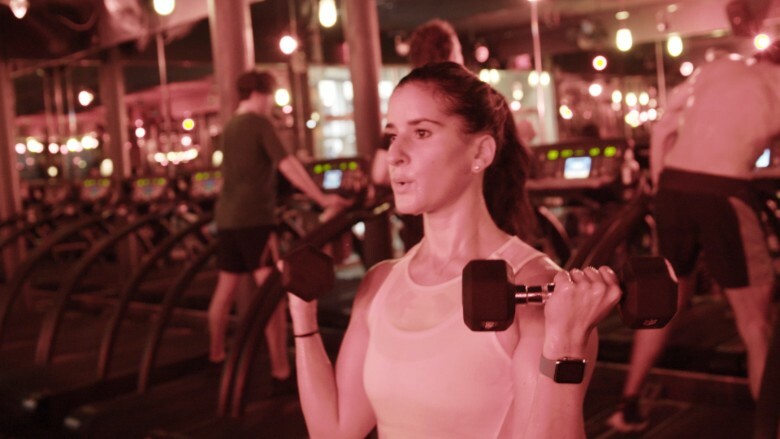 ClassPass gives subscribers like Chloe unlimited access to classes at 1,000 New York fitness studios for $125 a month. A one-off boutique fitness class costs about $35, so by attending 14 classes a week, Chloe spends just $2.25 a class -- a steal. I decided to see if I could be as dedicated -- and as financially nimble -- as Chloe. Monday. I signed up for a lunchtime Pure Barre class and a 6 pm high interval training class, As One. My co-worker Molly was my ClassPass guru this week -- part supportive friend and part drill sergeant. Together we did Pure Barre, a manageable mix of pilates and ballet. As One was a boot-camp style class that involved lifting large bags of what felt like concrete behind our heads. "Why do people do this?" I asked the instructor. Classpass super user Chloe in a Barry's Bootcamp session. Tuesday. I woke up exhausted and sore. I quickly ruled out a morning workout. ClassPass allows you to sign up for classes a week in advance, starting at noon, and members are obsessive about this. They set reminders on their phones, computers, and get reminders from friends. Molly was my reminder. "Oh my god, what are you doing?" said Molly. "Um I'm walking?" I answered. "You have three minutes! You have got to be at your desk!" In just 24 hours ClassPass became my new social media. I was checking the availability of classes like a Facebook (FB) feed. Later that day I signed up for a 5:15 pm restorative yoga class at Naam Yoga. It was just what I needed -- close to work, the right time, and easy on the shoulders. Wednesday. I wanted to take aqua cycling at Aqua Studio NY with Molly, but it was booked. I signed up for Core Fusion Barre at 5:40 pm. I had to meet a friend at 7:45 pm yet found myself wondering if I could fit in another class in between. If I left Core at 6:25 could I technically make it to yoga by 6:30? I decided that was a little ambitious, and I didn't want to risk having to pay the $20 cancellation fee. The Core Fusion class was packed. The classes are high turnover, high volume, and high intensity. My legs felt like jello afterwards. The writer tried Trampolean (left) and lots of other classes. Thursday. It was 5 pm and I hadn't signed up for a class yet. With limited options I was left with Trampolean. I was expecting this class to be a joke. Jumping around on a trampoline? Come on. By 6:10 pm I was eating my words and working hard to stay on my 2x2 trampoline. Friday. Dancebody was the class I was most excited for. I was signed up for the 5:30 pm session. Since I have a dance background I expected to look and feel like a pop star. What I really looked like was a teenybopper flailing around at a Justin Bieber concert. But the challenge made me want to come back to master the moves. Saturday. A blizzard hit New York City, and everything in the city was closed. It was a much needed day off. Sunday. The ClassPass app lets you search classes based on their location and time, and I found a 6:15 pm yoga class at The Three Jewels six blocks from my apartment that was perfect. At the end of the week I did seven classes, half of what Chloe does regularly. Fourteen classes a week isn't realistic for someone like me who doesn't have as much flexibility in their work schedule. But I got my money's worth. I spent an average of $18 a class for the week. I probably won't keep my membership, but before it expires... there's still an aqua cycling and a Beyoncé dance class to try.